Homebi has been specialized in metal and fabric,bamboo ,wooden and plastic storage furniture for more than a decade. We focus on item quality,function,material, and style to make personalized furniture more available to users.We provide affordable and durable items to realize 100% customer satisfaction. The Homebi 4-Tier Shoe Storage Organizer is made of powrder-coated metal tubes and high quality plastic connectors meet your long-term storage demand. The shoe rack can place in your entryway,bedroom,closet,bathroom ,balcony and more places to provide large storage space to make home well-organized. Open slatted shelves design permits air circulation and not easy to deposit dust. Easy assembly with AI provided . Material:powder-coated metal tubes +plastic connectors. 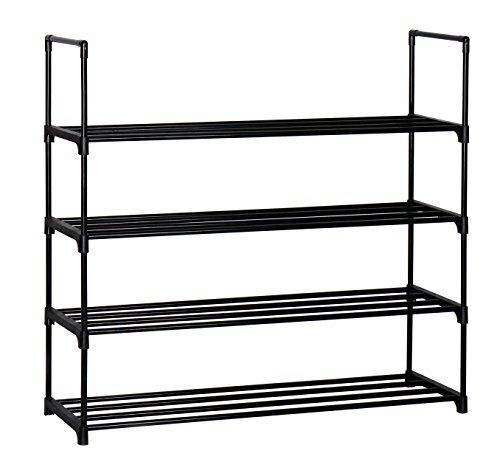 4-TIER SHOE RACK WITH DURABLE AND STURDY STRUCTURE: Made of powder-coated metal tubes and high quality plastic parts.The diameter of metal tube is 13.2mm,which enables this shoe rack load much heavier duty and more durable while using.And the powder-coated finish does not rust or corrode with normal use. 20-PAIR SHOE RACK WITH LARGE STORAGE SPACE AND PERFECT FOR BOOTS:Fit about 4 or 5 pairs on each shelf.Totally 4-tier shelf can store 16 pairs of mens' shoes and sneakers or 20 pairs of heels.The distance between each tier is 7.48"(19 cm),which makes it ideal for regular shoes.And space is big enough between levels to fit size 11 basketball high tops.You can also store jackboots, boots etc on the top shelf without worrying about falling off. DIY SHOE RACK ORGANIZER WITH THICKENED METAL TUBES:DIY to meet diverstifying demand:Order 1 to Install a 4-tier shoe rack,or buy two sets to STACK a 8-tier shoe rack,or split 1 set of 4-tier shoe rack into 2 sets of 2-tier shoes organizer. VERSATILE AND SPACE-SAVING SHOE TOWER:Add great organization and reduce shoe clutter while being elegant at the same time.Great dimension of 35.6"W x 12.0" D x 33.27"H(90.4 x30.5 x84.5cm) makes it a perfect storage solution for your entryway,foyer,wardrobe,closet,dormitory,patio,cabinet,garage etc. EASY AND QUICK ASSEMBLY:Very easy to set up and came with extra parts.If you HAD ANY QUESTIONS about the item or assembly parts quantity,please email us via AMAZON BUYER MESSAGE or email our CUSTOMER-SERVICE TEAM.We can guarantee that all the issues can be solved WITHIN 24 HOURS.We will provide you with satisfactory service.